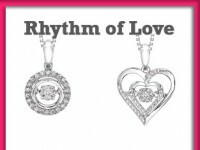 The hottest new item Reiniger Jewelers has to offer is the Rhythm of Love line. We have never seen anything like this before! These are vibrating pendants and earrings that are powered by your heartbeat. The eye catching diamonds are floating in the center of several settings of sterling silver and white gold. Your heart’s beat will cause the center diamonds to constantly move and catch the light and eyes of everyone. This must have item is sure to fit the pocket book of anyone, starting at just $79!! Check out our variety of styles in either location today!